The design concept for the motor yacht ‘joyMe stems from the owners desire to produce something different and very personal – a true reflection of his taste, which he had been unable to find in existing yachts in the superyacht market. This challenge ended by producing an interior universe with many different dimensions. Each compartment of space within the yachts interior was treated as a separate entity with its own story and philosophy, benefiting from its own atmosphere, communicating different emotions and feelings to its guests. 'joyMe is the biggest yacht under Croatian flag available for charter on the Adriatic. The guest accommodation is located at the main deck! And that is...a unique yacht. With professional Croatian crew of eleven and location in the middle of the coast in Marina Frapa only 30 km from Split airport, she is the best option if you want to explore the coast of Croatia and Montenegro. More than 1000 islands including the most popular ones: Hvar, Kornati, Brac, Vis, are there with even more secrets to be revealed to our guests - in our home waters, the beautiful Adriatic Sea. 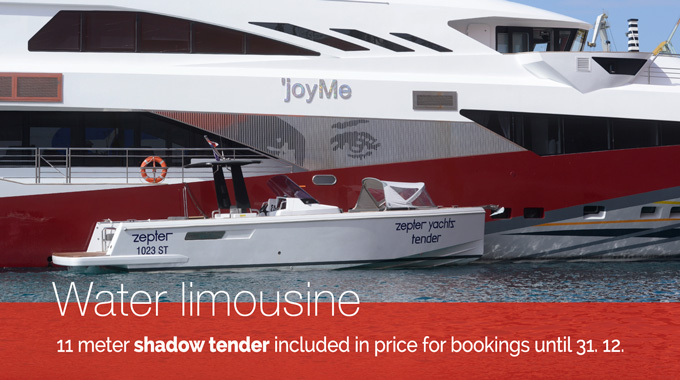 The fun starts when she hits the waves, uncompromised construction and hydrodynamic optimized hull leave nothing less then pure joy of exploring the seas on board the ‘joyMe. The 50 meter trideck displacement superyacht ‘joyMe offers accommodation for up to 12 guests in 6 in-suite air-conditioned cabins and has crew quarters for 11 crew members. LOCATION Marina Frapa, Adriatic Sea (30 km from Split international airport and 90 km from Zadar airport). LOWER DECK The Gym, Finnish sauna & Hammam SPA with sea view. MAIN DECK 4 Guest sea view cabins; Dinning space, the pantry, main saloon, day head, cockpit lounge; Guest cabins each enjoy large bathrooms that remind on luxury homes, detailed to maximum attention to the styling; Chic, Print, Nature & Mondrian cabin. VIP DECK The owners’ apartment, walk-in bathroom, Master lounge, Wheelhouse, Portuguese bridge with seating, Sunbeds on the bow. SUN DECK 3.5 meter Jacuzzi and sky lounge especially attractive in the evening. The interiors of ‘joyMe make her a floating piece of contemporary art, and the story begins on the main deck. The first part of saloon has being designed as the lounge area whose extension is the cockpit. Once you look deeper in the exteriors - you will be able to recognize her soul. A soul that stands out amongst even the most luxurious yachts that cruise the Adriatic. The exterior areas are easily accessible and connected by large corridors. Many charming places on the open air invite you - from stern cockpit to the small sun pad in the bow tip, from the pool area to Portuguese bridge seating lounge. The joyful colors and comfortable, ergonomic seating give a hard choice on where you will want to enjoy more. And if you take in consideration that at any point you are surrounded by the crystal blue Adriatic Sea, it just can't get better than that!